Doll Dilemma: What do you do when your celebrity likeness behaves badly? If only Miley Cyrus were as levelheaded as her fictional counterpart Miley Stewart! Her TV persona dealt with the dual-edged sword of fame wisely and maturely. Before Miley caused jaws to drop nationwide, Pee-wee Herman’s real-life actor got caught “red-handed” in a movie theater. It was a scandal. Manufacturers hold their breath when they ink a deal for a celebrity likeness. Look how sweet and innocent Britney Spears was with her look-alike doll. 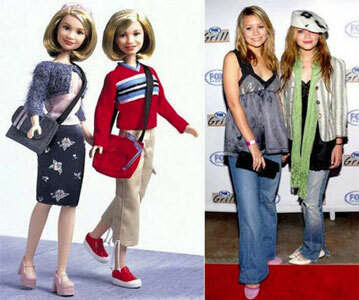 Every age of Mary-Kate and Ashley Olsen was captured in doll form, from infants in “Full House” to teenage fashion divas. Their personal behavior has become tabloid fodder. Macaulay Culkin became a full-blown star for his role in the “Home Alone” franchises. Today, he is a pale shell of his childhood glory. 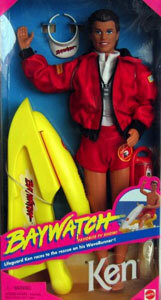 Ken donned David Hasselhoff’s short shorts in his incarnation as a “Baywatch” lifeguard. Luckily, he didn’t try on the Hoff’s bizarre Internet behavior. Undeniably, the queen of the lashing-out scene is Lindsay Lohan . . .
. . . but back in late 2004 she was a doll in Mattel’s My Scene play world. Yes, like a high-strung tween who won’t take her time-out quietly, Miley continues to hog the limelight even after her twerking tantrum on MTV. Now she is overseas acting like a precocious brat, smoking pot onstage, boasting about her bad behavior, and all the while declaring herself a feminist. 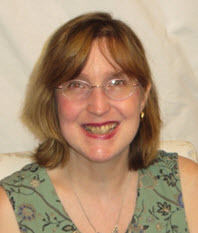 It’s like a bizarre mash-up of Gloria Steinem meets Frankenstein! Something monstrous is bound to happen down the road a spell. What’s fascinating about Ms. Cyrus is that she first entered our consciousness as Miley Stewart, a supposedly down-to-earth girl who just happened to be a rock goddess. Wearing a blond wig and bolder colors when she performed onstage, the humble, everyday character of Miley Stewart morphed into Hannah Montana, a smiling, singing, toothy superstar. Balancing a home life filled with a supportive though bemused dad (played by her real-life father) and a smart-aleck brother, Miley Stewart was able to have “the best of both worlds.” Even her show’s theme song promised that! In actuality, Cyrus has the worst of both worlds: fractured, broken real family and out-of-control, raising-the-ante public life. One of the perks of being a young starlet in Hollywood are the licensing deals that often come one’s way. For Miley Cyrus, it meant an empire of Hannah Montana novelties. And, naturally, among the items were fashion dolls galore. 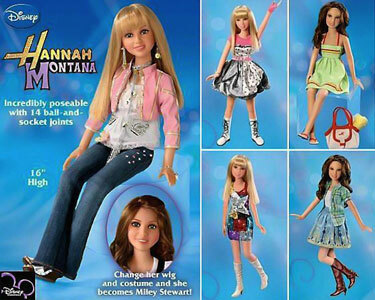 There are tons of Hannah Montana play dolls, styling dolls, singing dolls, and holiday dolls. My daughter has two. She even has a singing Hannah Montana Christmas card that she’s saved for years now. How sad that this seemingly likeable character was totally fictional. 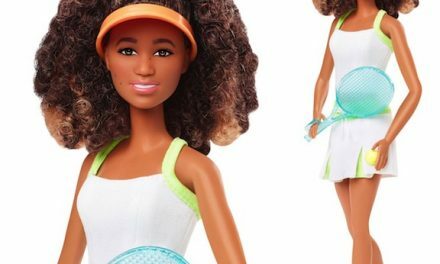 That’s the risk that is run when a company makes a doll in a celebrity’s likeness. Even if it’s the character that is being replicated, for many young kids it is hard to distinguish between the performer and the role. I’ve heard some parents talk about how they are going to throw the Hannah dolls into the trash bin (on plastic recycling days, naturally). They are offended by Miley Cyrus’s current antics. I don’t blame them, but she’s not the first—and, believe me, won’t be the last—onetime doll that has behaved badly. Here’s a very brief salute to a bunch of dolls that have given their owners a dilemma: Do you continue to proudly own them and display them? Do you throw them away out of shock, disgust, and embarrassment? Or, do you put them on eBay, jacking up the price to cash in on the tabloid headings? Better yet, do you preserve them, waiting for the final blowout? Every speeding, careening train has to eventually fall off the rails—do you wait and sell when the conflagration occurs? I’ve faced that quandary before with Pee-wee Herman. 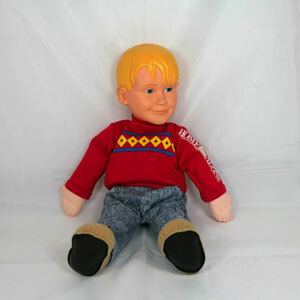 I had his original talking doll and loved it. I was a big fan of his Saturday-morning playhouse show. (I even saw him perform it live at Carnegie Hall!) My doll version was one of the pull-string types. 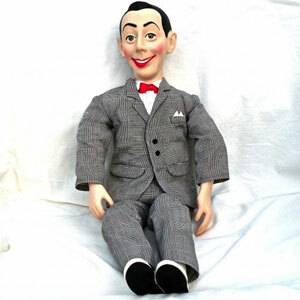 When the string was tugged, Pee-wee would let loose some of his most beloved catchphrases. How sad that Mr. Herman got arrested while attending an adults-only movie at a cinema where gents did more than just watch the film. It became an interactive event. 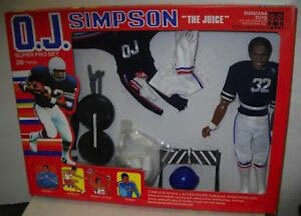 He was arrested, taken into custody, got his mug shot spread all over the news, and went into career exile for a while. Suddenly my Pee-wee doll had lost its childish glow. And the string-pull took on a horrible new meaning. Still, double entendre be damned, I kept the doll and didn’t cast it away. Despite seeing its secondary market value spike and cycle downward as his notoriety ebbed and flowed, I’ve held on to that doll. Why? Because it was a cute, fun, very engaging bit of my youth, and seeing it makes me remember a happier, sweeter time in my life. I guess it doesn’t matter to me when a celebrity acts poorly. If the character they portrayed and the doll that commemorated it still tickles my fancy, I’m willing to give that likeness a second or third chance. Let’s face it, if Hollywood producers are able to be that forgiving toward Robert Downey Jr., who am I to be hardhearted toward his Iron Man dolls? PreviousCould She Be The Most Beautiful Doll in the World?